We have been pleased with the value that our video equipment has been since we started more serious video production in 2012. We have produced thousands of DVDs as well as producing content for TV broadcast and social media distribution. These cameras will bring a higher quality to our media production. The controller allows remote adjustments to each camera without those at the video mixing desk to have to go to the cameras or try to communicate adjustments with camera operators. We are thankful for the support for this form of ministry in the past and we look forward to producing more media and scattering it like the leaves of autumn. 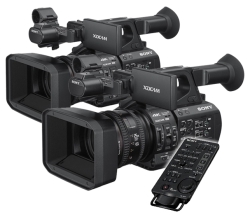 Digital HD Recorder & Cable: $1823.14 - All covered, Thank You! 2 SSD drives to store recorded footage: $1194.18 - All covered, Thank You! LED Lighting Equipment: $1,280.00 - All covered, Thank You! Lighting Reflector: $22.18 - All covered, Thank You! 2 Headphone Sets: $119.90 - All covered, Thank You! 2 Camera Chairs: $399.05 - All covered, Thank You! Microphones, cables and adapters: $73.00 - All covered, Thank You! Protective cases for Equipment: $539.40 - All covered, Thank You! SD storage media and consumables: $183.43 - All covered, Thank You! HDMI to SDI Converter for Field Recording & Cables: $646.72 - All covered, Thank You! 2 Manfrotto Tripods with fluid heads and bags: $1485.91 - All covered, Thank You! Mini Studio Recorder & Cable (for getting video straight into computer)- All covered, Thank You! H264 Pro Recorder. (For live compressing video - big time saver) - All covered, Thank You! Tripod handles. (Extendable for extra stability): $286.17 - All covered, Thank You!